Ever since we had our Great Greek Yogurt Contest I have had yogurt on my brain. This has led me down a crazy path of trying to make my own yogurt. It all sounds a little dangerous and sort of earthy-crunchy. Who in their right mind would be into yogurt enough that they would risk introducing bacteria into perfectly good milk? Luckily curiosity overcame my fear of bacteria or being labeled a hippie and I gave yogurt making a try. Better yet, I have made a couple batches and lived to tell about it. Making yogurt takes a bit of time, but it is pretty easy to do. If you can read a thermometer, you can make yogurt. The real question is, is it worth it? For me, it totally is. The yogurt I made with 1% milk was thick and creamy and did not have the overly tart taste of commercial plain yogurt. The only tricky part of process is keeping the yogurt at the correct temperature to allow the yogurt culture to work its magic. In order for the yogurt culture to work, you need to keep them around 50 Celsius. Celsius seems to be a little easier to work with for this than Fahrenheit. There are a number of different ways to go about doing this. Prewarming the container you are going to culture the yogurt in helps. I microwaved some water in a glass pyrex dish, then drained the water. It also helps to wrap the dish in a cloth to insulate it. While this works, I found it is even better to use a cooler with some warm water in it. I looked at a number of different recipes and tutorials, including this one, before I attempted yogurt making. Here is my method of making yogurt. It can probably be easily doubled. Definitely use common sense when you give yogurt making a try. 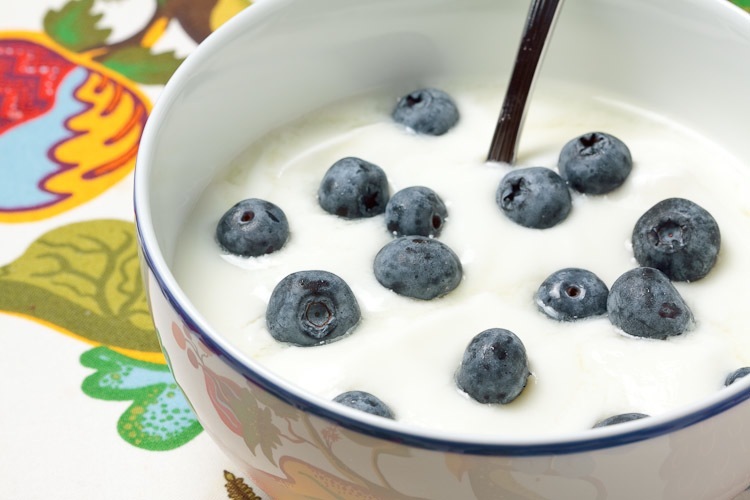 It might not be a good idea to try homemade yogurt if your immune system is weak. Also try to keep everything sterile. You are growing bacteria; you want to make sure you are growing good bacteria. If the yogurt looks or smells weird, toss it and try again. If you want thicker yogurt, try adding 2 tablespoons of powdered milk. Try it without for your first batch though as it will alter the flavor slightly. Wash the containers with hot soapy water. I am sure it is better/safer to use glass containers that you can sterilize, but I am far too lazy and haven’t died yet. 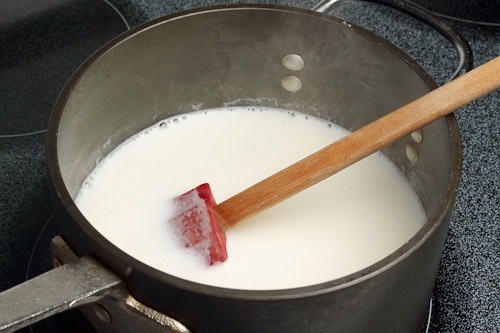 Using a pot with a heavy bottom, warm the milk over a medium heat. You want to bring the milk to 185-195 F (85-90 C). Keep an eye on it to make sure it doesn’t boil over. Let the milk cool to 122-130 F (50-55 C). If you want to cool the milk a little quicker, place the pot in cool water. I just stopped up my sink and put the pot in. With the milk cooled, add the yogurt. Stir or whisk the mixture to make sure the yogurt is well distributed. Fill the containers with the mixture and cover tightly. Meanwhile heat a quart or two of water to 130 F (55 C). 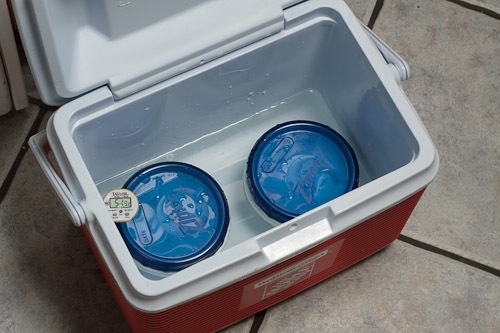 Add the water to the cooler and wait a little in order to allow the cooler to warm up. Carefully place the containers in the cooler. The water should not come over the covers…unless they are shut really well. Adjust the water accordingly. 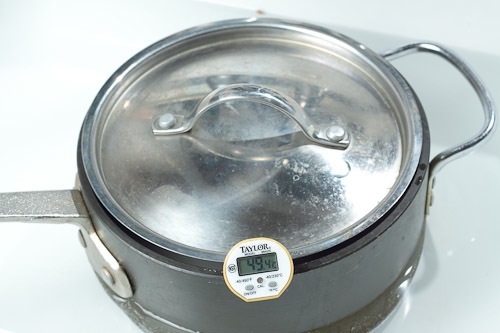 Make sure the water is not above 130 F (55 C). Anything above that will kill the yogurt starter. Add some cold water if you need to adjust the temperature. Close the cooler and leave it in a warm place. After 3 hours the yogurt should be ready. I am an indian and the whole country(yes i mean that) make home made yogurt in a jiffy. AFter your Step 4 (cool the milk to luke warm – or bit more ), pour the 2 tbsp yogurt( from earlier batch) into the new container, close and move it round so that it coats the interior well . Then pour the milk and keep it it a warm place (In winter , I warm the oven for 5 min and then place it in there. Thats it..DONe..